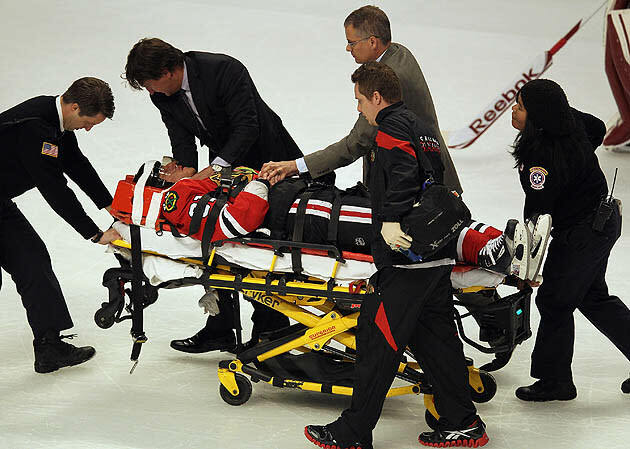 Stretchers change everything in the NHL. When Marc Savard, David Booth and others were strapped to them, it led to the banning of blindside hits. When Max Pacioretty ended up on one, it led the Montreal fans calling the cops on Zdeno Chara and the league changing the geographic makeup of its "turnbuckles." When Nathan Horton was carted out on one, Aaron Rome was given the longest suspension in the history of the Stanley Cup Final. Absent a stretcher in any of those situations, the visceral impact diminishes, as does the palpable outrage. The 2012 Stanley Cup Playoffs have been a unique brand of brutal. There's rough stuff in nearly every series, including a half-dozen line brawls. Fighting is up; and, of course, so are the ratings. So we applauded the New York Rangers physically dominating the Ottawa Senators in Game 1, recoiled when Matt Carkner struck back and winced when Daniel Alfredsson was concussed. We marveled at the Flyers' antagonism of the Penguins, were awed by Pittsburgh's Game 3 ungluing and then cringed when Arron Asham and James Neal went headhunting. We were appalled by the lack of punishment for Shea Weber, appalled by the punishment for Andrew Shaw and puzzled other incidents that went under the radar (Brent Burns wipes brow). We've had seven suspensions of varying degrees of validity and duration. But until Tuesday night, we hadn't had a stretcher. And stretchers change everything in the NHL. Phoenix Coyotes winger Raffi Torres' head shot on Marian Hossa of the Chicago Blackhawks, which sent him to the hospital during the Coyotes' Game 3 overtime win, was the thunder in a perfect storm for NHL culture of violence criticism. Boom, down goes Hossa; boom, there goes Neal for one game, Asham for four and Nicklas Backstrom for one; and out come the knives for Brendan Shanahan, Gary Bettman and the NHL. They say the postseason is a pressure cooker; look no further than what's happened in the last week. All of the vile nastiness that resulted in a total of 52 suspensions this season has been reduced down to its essentials: Head shots, cheap shots, concussions to star players. It's the worst highlight reel Shanahan's ever seen. Have the Stanley Cup Playoffs gone off the rails? If so, who's to blame for it? Can the league get them back on track? For all the flak Shanahan has taken on the lengths of his suspensions so far in the postseason — an extension of the criticism he received from some circles in the regular season — he has a golden opportunity to send a clear message here. Any suspension less than the remainder of the postseason for Torres would be downright insulting, both to the players — whom the league says it is trying to protect — and to the fans who are getting really, really tired of seeing guys being carted out of the arena. If Torres plays another playoff game this season, Shanahan will have made his biggest misstep yet. Shanahan said the NHL was "willing to accept Neal's assertion" that he jumped at Couturier "to brace himself for an unintended collision." Shanahan's decision is supposed to be based on WHAT HAPPENED, not on what the player DIDN'T INTEND TO HAPPEN. It should also be noted that Neal was fined once this season and received two warnings for incidents _ and that he was suspended three years ago for a check from behind. From here, the run at Couturier was much worse than the one at Giroux. From here, if Shanahan used a dart board, his decisions would make as much sense. His most grievous post-season error was not suspending Nashville's Shea Weber for slamming the head of Detroit's Henrik Zetterberg's into the glass. He slapped the all-star defenseman on the wrist with a $2,500 fine. The decision on Neal just re-affirmed this: Shanahan is a master at inconsistent rulings. Even for Bettman, who set new lows in his spectacular show of denial in response to the state of Derek Boogaard's brain after he died of a drug overdose last summer, this was ludicrous. It also followed another head-scratching day in N.H.L. justice, when the Brendan Shanahan comedy hour produced four videos describing four player suspensions he was handing down as director of "player safety." (Yes, those words should be in quote marks until anyone in the league office shows they care one whit about the safety of their players.) If you can follow the logic through those four — particularly how the Penguins' James Neal earned only a one-game suspension for head-hunting two players on a single shift — you belong at M.I.T. Or Shanahan's next dinner party. The officiating hasn't just been bad in recent days. It's been negligent and sometimes weirdly absent. There was Ryan Clowe playing the puck from the bench in the final days of the season without any official knowing. There was an obvious offside goal for Philly to start a comeback in Game 1 against Pittsburgh. Last night, Nashville's David Legwand closed his hand on the puck in the crease and no official saw it, and then came the hit on Hossa, a blatantly illegal play that went uncalled as NHL commissioner Gary Bettman sat in the stands at the United Centre. "I can't believe four guys missed it," said Chicago head coach Joel Quenneville. Ian Walsh and Stephen Walkom, former NHL head of officiating, were the men in charge for Game 2 of the Rangers and Senators and Game 3 between the Coyotes and Blackhawks on Tuesday night. It starts with the officiating. It's been putrid. For all the talk of supplemental discipline's role in controlling games, it starts with the zebras, and they've been about as in control as Ke$ha on a bender. Finally, Allan Muir of Sports Illustrated makes one of the most salient, brave points of the playoffs: Where the [expletive] is the NHLPA in all of this? The PA needs to negotiate for a more active role in the disciplinary process. Not just a seat at the table, but perhaps two on a three-man committee that metes out the sort of justice that leaves no room for interpretation: clean up your act, or shop your limited skills elsewhere. Maybe it's something bolder, like reducing rosters by one in exchange for other concessions. But before he even sits down with the league, the players have to be on the same page. They have to truly understand what's at stake. And Fehr is the only one who can get them in a room make that happen. • Raffi Torres had 26 points this season, and two points in three playoff games. • Carl Hagelin and Andrew Shaw were offensively talented rookies. • James Neal was a 40-goal man. • Nicklas Backstrom is one of the NHL's top centermen. Go back through the soon-to-be 53 suspensions for 2011-12. Ovechkin. Doan. Skinner. Keith. Lucic. Letang. In the fines: Doughty, Tavares, Elias, Jordan Staal, Karlsson and Shea Weber. It's not the cheap shot artists or the knuckle-draggers or a select few players that are partaking in the illegality that leads to supplemental discipline — it's everyone. Or maybe we've made it everyone. We're in a culture of outrage, as running to Twitter and demanding suspensions for the most pedestrian of violent acts, within the context of the NHL — Matt Carkner's fight-after-a-clean-hit-esque pounding of Brian Boyle after Boyle was unwilling to answer for pummeling Erik Karlsson in Game 1 — become calls for swift, emphatic justice. Yelling about a blown call in the arena during the game has long been replaced by raging against injustice on social media during the game. It's part of the hockey fan experience; the guess-the-suspension/wheel of justice debates have replaced Gretzky vs. Orr as pub banter. You can blame the NHL for facilitating that, or you could rightfully place the blame on media and fans that allowed the bile on sports talk radio to infect every facet of the fan conversation; media and fans that know if they yell loud enough and climb high enough on their moral high ground, they can shame someone into a decision or an apology. That's led to a culture that's produced over 50 suspensions and countless more fines this season. "A lot of it is perception and misperception. The game is physical, the game is emotional. These games are hard-fought," Gary Bettman told the Chicago Tribune. "Having said that, I'd say player safety is monitored closely and being dealt with in an appropriate way." My skin is crawling having to agree with Bettman, but I agree with Bettman: Everything that's been done and said leading up to the Stanley Cup Playoffs is consistent with the rulings that have been made thus far. Yes, Shaw's suspension for the Smith hit was ridiculous, but that's what the general managers wanted for goalie interference. Yes, the caste system for star players getting softer penalties than repeat offenders can be seen as inadequate, but that's what the general managers wanted. If the argument is that supplemental discipline needs to be reconsidered in the next CBA, I agree: Especially when it comes to the pocket change fines players receive for their actions. If the argument is that Shanahan's lost his moral compass or, worse yet, his testicles in this postseason, then I disagree. He got Weber wrong; really wrong. But I don't see this as rampant inconsistency; if you do, then you haven't been paying attention to the standards they've established for the last several months. Lord knows the players apparently haven't.